Our shared advantage in our communities and in the marketplace is our co-operative identity. It’s what makes us a community asset. It’s what makes us root jobs and wealth in communities. It’s what brings us together to address issues both large and small for the betterment of our economy and society. It’s what makes members be able to actualize themselves fully by participating in their lives in a more un-alienable manner. 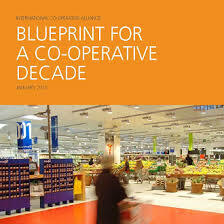 No other firms put members above profit in a democratic manner as co-operatives have done for over 150 years. Co-operatives are a dual nature organization putting social goals like food security, safe and affordable housing, secure banking services and dignified jobs as purposes with sound business operations as a method to achieve them. All co-operatives share the co-operative identity, principles and values which are stewarded by co-ops ourselves through the worldwide apex organization, the International Co-operative Alliance. Having principles and values is one thing, practicing them is another. For assistance with how to act with these beacons lighting the path read the Blueprint for a Co-operative Decade by the ICA. We’re proud to work with our follow federations on celebrating and protecting the co-op identity including the Neighboring Food Co-op Association, the Valley Co-operative Business Association and the United States Federation of Worker Co-operatives. You can read more about our thoughts on the co-operative identity by reading our Resolution on the Co-op Identity.